Costco offers pre-packaged croissants in its stores. Croissants can be a breakfast option, snack or used for sandwiches. However, these croissants are high in calories and should be consumed in moderation. 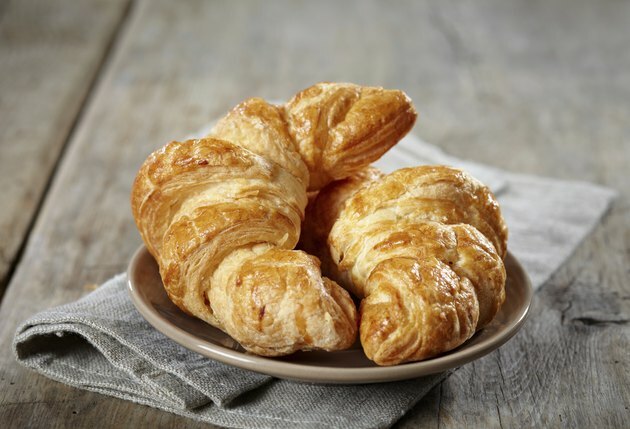 Costco croissants contain 339 calories per serving, notes LIVESTRONG's MyPlate calorie tracker app. Each croissant is considered one serving, and each box includes 18 croissants. Costco croissants are high in calories, carbs and saturated fat and should be avoided or consumed in moderation if you're monitoring your calorie intake. Costco croissants contain 35.9 grams of carbohydrates and 17 grams of fat. Of the 17 grams of fat, 12 grams are saturated fat, which is high for one food item. Consuming foods high in processed carbs will lead to an energy surge followed quickly by an energy crash. It's best to eat a balanced snack that contains both carbs and protein for stabilized energy. The free LIVESTRONG MyPlate calorie tracker app for iPhone and Android has helped millions of people lose weight the healthy way -- by getting support from an active community as they track their eating and exercise. Consistently a top-rated app, MyPlate offers the latest technology in an easy-to-use tool that includes millions of foods and recipes, 5-minute in-app workouts and a robust support community.